Scrappin' Patch Scrapbook Supplies NZ: DT Inspiration - Bo Bunny Detour. This is my last post for 2012! Gosh, hasn't this year just flown by... I hope you have finished all your Christmas shopping and you are relaxing and enjoying a nice holiday break. 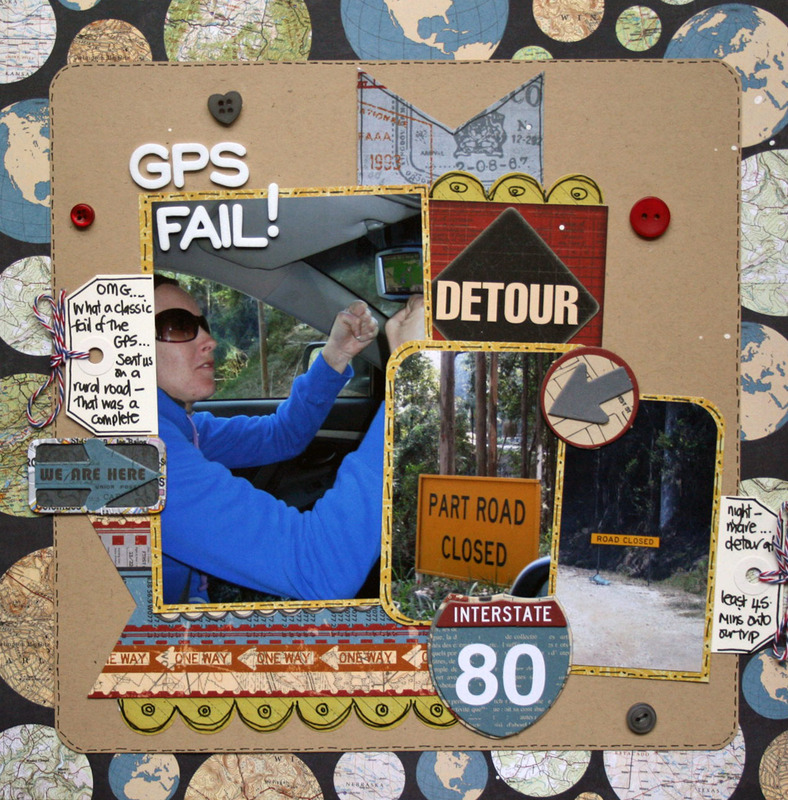 I have my last layout to share with you using the Bo Bunny Detour Range - it honestly was the perfect set of papers to do a layout on our major GPS fail when it sent us on a back road that was closed on our road trip from Brisbane to Sydney a couple of years ago now! This layout is all about recording the memory... the road we ended up on was just horrendous and almost completely washed out in places. It was one of those 'should we believe the GPS' moments or should we trust our gut instinct and not go the way it said we should. Over an hour round trip later... we shouldn't have trusted the GPS at all. I created a border around my Kraft cardstock using the globetrotting patterned paper. I then accented my photos using the chipboard pieces, fussy cut out the detour sign and finished off with some shipping tags which I just love for journalling. I have really enjoyed using the Bo Bunny Detour Range. If you have some travel photos to scrapbook it is definitely one to have a look at in the shop! That's all from me for the year... I hope you have a Merry Christmas and a relaxing New Year!